Dubai's economy grew 1.94% in 2018, hitting its slowest pace since a contraction in 2009 when the economy was hobbled by a debt crisis. Dubai, which has a diversified economy that focuses on tourism and international business services, has been hurt by a rough patch amid a downturn in its real estate market. "A weakening external backdrop, a strong US dollar and the ongoing correction in the property market are headwinds for a number of vital sectors," said Monica Malik, chief economist at Abu Dhabi Commercial Bank. The economy slowed from 3.1% growth in 2017, revised government data showed. The 2017 figure was revised from the previous growth figure of 2.8%. 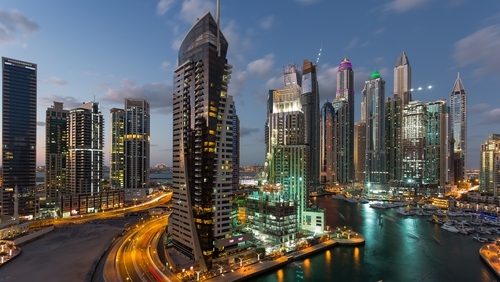 Property prices in Dubai have fallen by more than a quarter from their peak in 2014. S&P said last month it expects prices to fall another 5-10% this year due to a continued gap between supply and demand, before steadying in 2020. Dubai needed a $20 billion bailout from oil-rich Abu Dhabi to escape a debt crisis in 2009 caused by collapsing property prices, which had threatened to force some state-linked companies to default on billions of dollars of debt. Analysts expect some economic recovery for Dubai ahead of 2020 when the city hosts the World Expo event. The government said GDP growth was largely driven by the performance of trade related activities, which grew by 1.3% in 2018 from a year earlier, representing 18.1% of the total growth achieved last year. In 2017, wholesale and retail trade grew 0.9%. It said real estate activity grew 7% in 2018 and accounted for nearly 25% of total economic growth. The real estate sector growth was revised to 4.4% in 2017. Growth in the transport and storage sector slowed down to 2.1% last year from a revised 8.4% in 2017. London-based Capital Economics in a report said the property sector is likely to remain in the doldrums while a weakness in the global economy will weigh on Dubai’s manufacturing and logistics sectors. But this should be more than offset by a step-up in preparations for, and the hosting of the 2020 World Expo, it said. Officials have previously estimated that Expo will provide a boost to the economy equal to $38 billion, or 33% of GDP. Capital Economics is forecasting GDP growth of 3.8% this year before a pick-up to 4.5% in 2020. But it also warned main risks to the outlook stem from long-standing debt problems, citing IMF data that show that the debt of Dubai’s government-related entities (GREs) – which were at the heart of the Dubai's debt crisis in 2009 – amounted to $60 billion, equal to 50% of Dubai’s GDP. Abu Dhabi is expected to roll over for the second time $20 billion of debt, due this month, that it extended to Dubai during its financial crisis a decade ago, Reuters reported last month citing three sources familiar with the matter said.